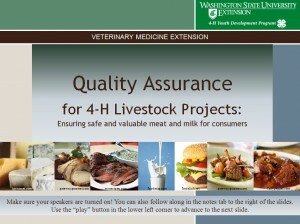 Check out the new on-line training modules for 4-H volunteer leaders! On-line training is an accessible, interactive, and fun way to learn about topics that are important for youth livestock projects! 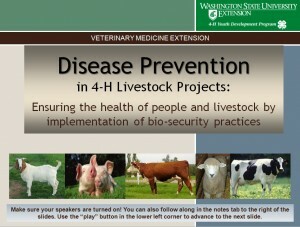 “Ensuring the health of people and livestock by implementation of bio-security practices.”Designed specifically for 4-H volunteer leaders who work with livestock projects, the Disease Prevention Module is one of two modules brought to you by Veterinary Medicine Extension. This training module teaches you bio-security practices and how they can be used to reduce the risk of contracting and spreading diseases while raising 4-H livestock. It is a great way to learn disease prevention while providing you with inspiration and teaching ideas so you can bring these concepts to youth in your county! “Providing clean and comfortable environments to optimize livestock health and wellbeing.”Housing environments have a great impact on the health and wellbeing of 4-H livestock. 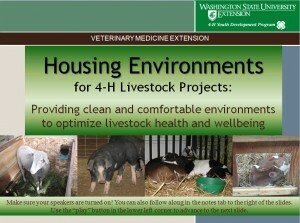 Therefore the third module in this series created for 4-H volunteer leaders focuses on optimizing housing environments. Learn the importance of minimizing environmental stressors and maximizing animal comfort in raising healthy livestock. This module also includes two activity booklets that can be used by youth in your county to learn about air quality and housing space requirements for their 4-H livestock projects.